Once snow crystals form in the atmosphere, they grow by absorbing surrounding water droplets. The snowflakes we end up seeing on the ground are an accumulation of these ice crystals. 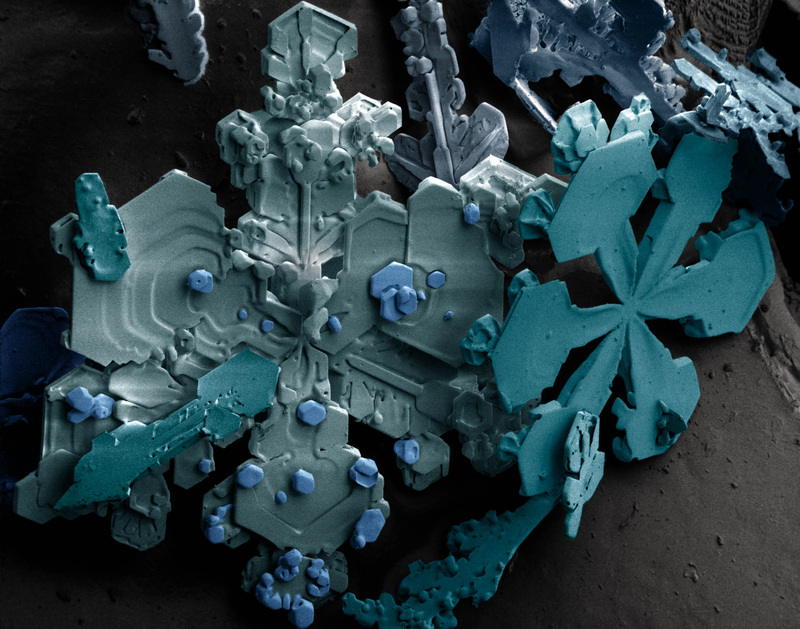 This magnified image of snow crystals was captured by a low-temperature scanning electron microscope (SEM). The pseudo colors commonly found in SEM images are computer generated, and in this case highlight the different flake formations. Whether winter storms produce snow relies heavily on temperature, but not necessarily the temperature we feel here on the ground. Snow forms when the atmospheric temperature is at or below freezing (0 degrees Celsius or 32 degrees Fahrenheit) and there is a minimum amount of moisture in the air. If the ground temperature is at or below freezing, the snow will reach the ground. However, the snow can still reach the ground when the ground temperature is above freezing if the conditions are just right. In this case, snowflakes will begin to melt as they reach this higher temperature layer; the melting creates evaporative cooling which cools the air immediately around the snowflake. This cooling retards melting. As a general rule, though, snow will not form if the ground temperature is at least 5 degrees Celsius (41 degrees Fahrenheit). While it can be too warm to snow, it cannot be too cold to snow. Snow can occur even at incredibly low temperatures as long as there is some source of moisture and some way to lift or cool the air. It is true, however, that most heavy snowfalls occur when there is relatively warm air near the ground—typically -9 degrees Celsius (15 degrees Fahrenheit) or warmer—since warmer air can hold more water vapor. Because snow formation requires moisture, very cold but very dry areas may rarely receive snow. Antarctica's Dry Valleys, for instance, form the largest ice-free portion of the continent. The Dry Valleys are quite cold but have very low humidity, and strong winds help wick any remaining moisture from the air. As a result, this extremely cold region receives little snow. The character of the snow surface after a snowfall depends on the original form of the crystals and on the weather conditions present when the snow fell. For example, when a snowfall is accompanied by strong winds, the snow crystals are broken into smaller fragments that can become more densely packed. After a snowfall, snow may melt or evaporate, or it may persist for long periods. If snow persists on the ground, the texture, size, and shape of individual grains will change even while the snow temperature remains below freezing, or they may melt and refreeze over time, and will eventually become compressed by subsequent snowfalls. Over the winter season, the snowpack typically accumulates and develops a complex layered structure made up of a variety of snow grains, reflecting the weather and climate conditions prevailing at the time of deposition as well as changes within the snow cover over time. Snowflakes are accumulations of many snow crystals. Most snowflakes are less than 1.3 centimeters (0.5 inches) across. Under certain conditions, usually requiring near-freezing temperatures, light winds, and unstable atmospheric conditions, much larger and irregular flakes can form, nearing 5 centimeters (2 inches) across. No routine measure of snowflake dimensions are taken, so the exact size is not known.